Knowing that the strength of the Ohio Democratic Party has a direct impact on the outcome of national, state, and local elections, David is committed to creating the most robust party infrastructure possible, supporting and implementing policies that improve Ohioans’ lives, and recruiting and assisting the next generation of public servants as they run for office at all levels and helping them make a difference once they get there. 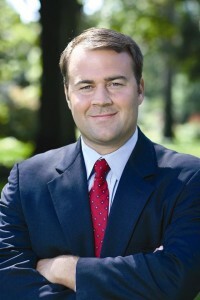 In 2006, David was elected to the three-member Hamilton County Commission. He served as the Commission President from 2009-2010. During David’s tenure at the County, Hamilton County won 19 National Association of County Awards for outstanding management practices, more than all other Ohio counties combined. David focused particularly on cleaning up the very poorly managed government that he inherited: adding much-needed transparency, championing greater disclosure and higher ethics, eliminating wasteful spending, and rebuilding the County’s reserve fund. Independent ratings agencies praised the County’s fiscally responsible policies. David was nominated by Ohio Democrats to run in statewide elections twice. In 2010, David ran for the office of Ohio Auditor campaigning on a platform of increasing efficiency and transparency in government while ending the gerrymandering that has poisoned politics in Columbus and Washington. His platform gained him the endorsements of virtually every major Ohio newspaper. And, in 2014, David ran an intense campaign to unseat the incumbent Attorney General, calling for greatly improved transparency and integrity in that office. Although both years proved to be wave years against Ohio Democrats, David set records (for a non-incumbent) in fundraising for both offices and received praise for running aggressive, substantive campaigns. David is married to Alana (Swartz) Pepper. Alana grew up in Adams County, graduated from the University of Cincinnati, and earned her Master’s Degree in Public Administration at Northern Kentucky University. Alana has spent her career helping those faced with mental illness. Last May, David and Alana welcomed their first child, Jacob “Jack” Hamilton Pepper, into their family. A Dayton native, Rhine McLin has a long history of active community involvement, which attests to her commitment to public service. In 2002, she became the third African-American Mayor and the first female Mayor in the city’s history. She previously served six years in the Ohio House of Representatives from 1988 to 1994, and was then elected State Senator for the 5th Ohio Senate District, serving Montgomery and Miami Counties. When elected in 1994, she became the first African-American woman to serve in the Ohio Senate. In 1998, McLin was elected by her peers to serve in leadership as the Minority Whip. Two years later, she was elected again to serve in the Senate leadership as Minority Leader. During the 2016 DNC Summer Conference held in Minneapolis, Vice Chair Rhine McLin has been elected as the Midwest Vice Chair of the Association of State Democratic Chairs. Congrats Vice Chair McLin!